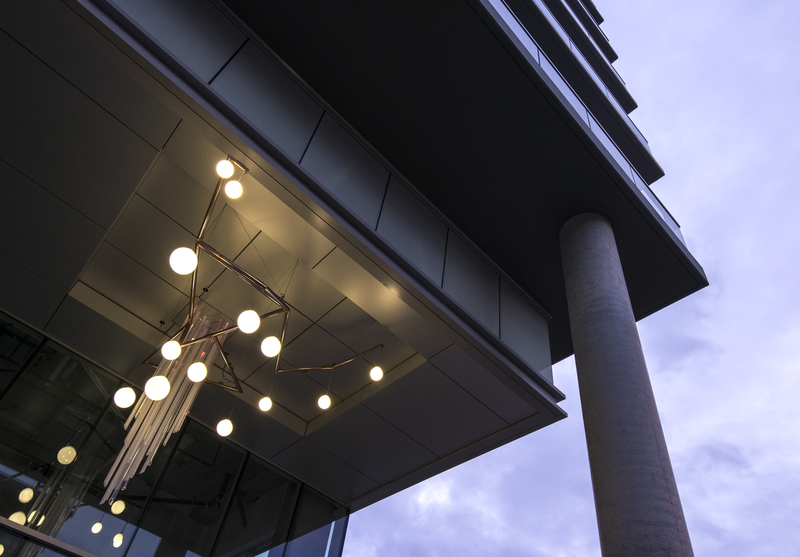 Hovering within the two-story atrium cut away from the façade of CentreBlock, and surrounded by its solid grey reflective surfaces, Cosmic Chandelier marks the transition from the streetscape of University High Street to the private residences and businesses within. 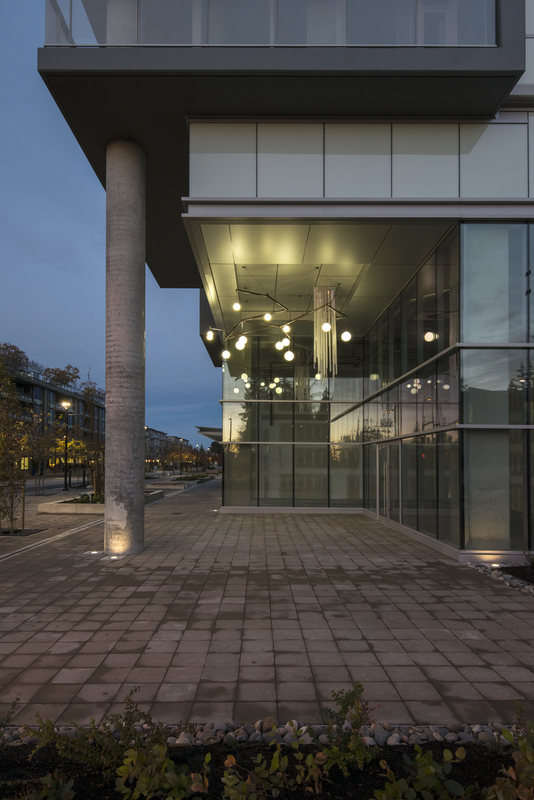 Programmed to respond to changes in ambient light and designed to capture the motion of the air, the artwork rewards the ongoing observation of viewers as they pass through during the habitual movements and pauses of everyday life. 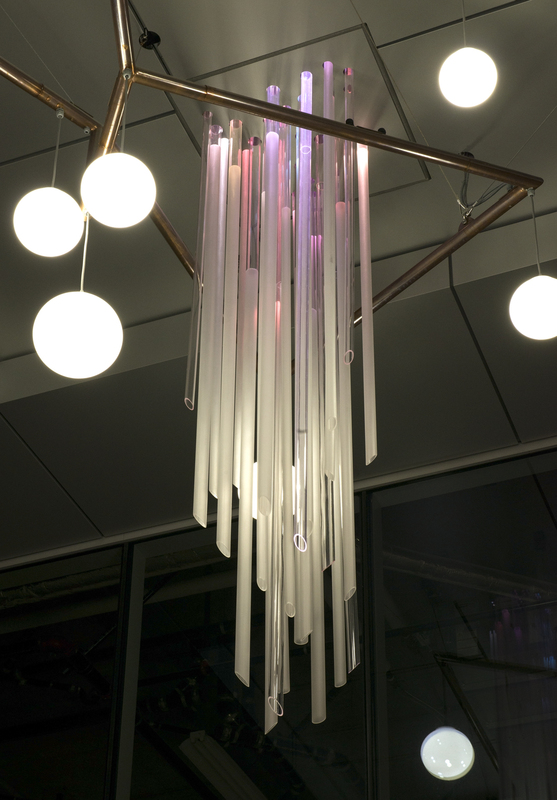 Cosmic Chandelier pins together futuristic materials and technologies with earlier innovations in manipulating light. Suspended chandeliers began to be found in prosperous homes in the 16th century, beginning simply as candles mounted on spiked timbers. Through ongoing iterations, they became platforms for aesthetic and functional investigations of light, using reflective materials such as mirrored glass, polished metal and quartz crystals. With the introduction of leaded glass, which was easier to work and better at refracting light, and especially through the innovative cutting methods of Daniel Swarovksy, the chandelier reached its functional and decorative zenith. Intended to brighten and adorn larger rooms and groups of people, the chandelier’s formal references ranged from neoclassical Greek and Roman motifs to natural ones: flowers, leaves and fruit. Capturing, reflecting and refracting candlelight in dazzling arrays, the chandelier mimicked the spectacles of the night sky and captured and concentrated this splendor in domestic space. In doing so, it further kindled the possibility of work, leisure and sociability after dark. 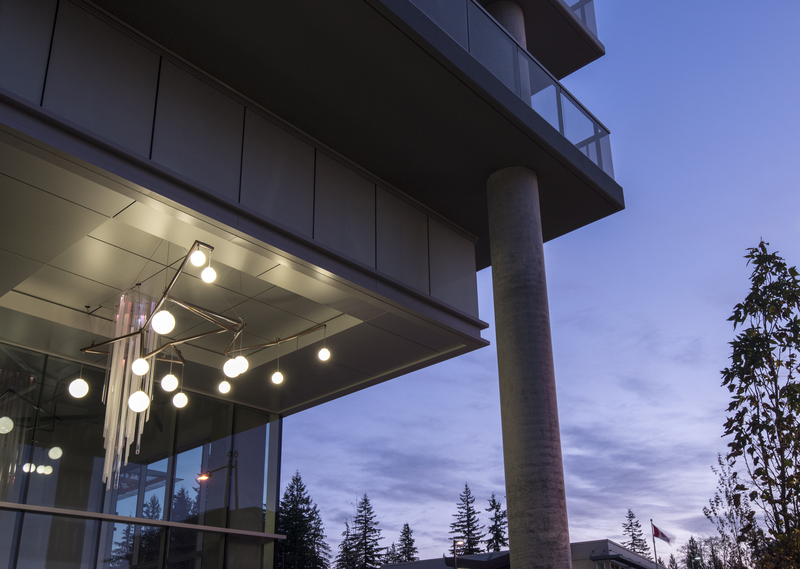 In Ward’s chandelier, the light cascading from above draws down all of these associated social and cultural meanings as it lights up the threshold between the private home and the public street. The High Street is in proximity to the University where illumination is a persistent metaphor for learning, and Enlightenment principles are both implemented and critiqued. The sculpture models the constellation Orion with its framework positioning pendant orbs higher and lower, relative to the distance of its stars to the Earth. 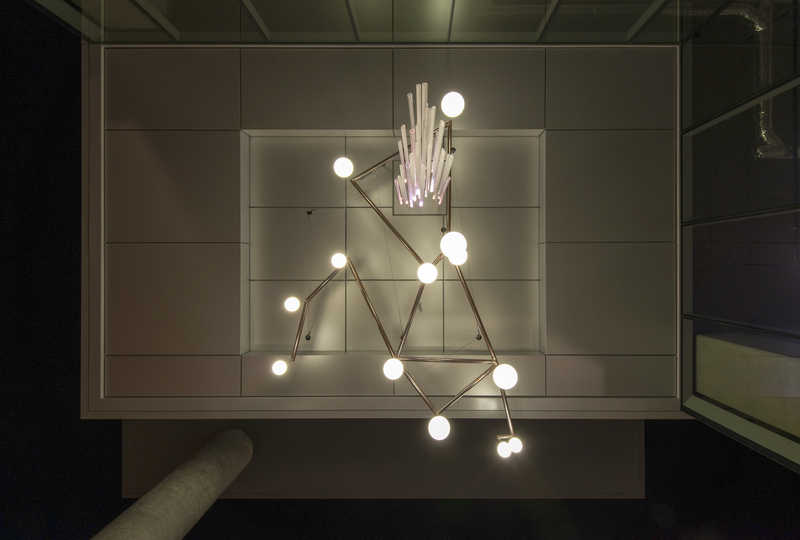 Suggesting a laboratory apparatus, the support structure is made of copper-clad steel pipes and cables, with frosted glass and LED pendants forming the cool, bright dots or stars we connect to outline the figure of the hunter/warrior. Against the torqued horizontal plane of the constellation map, Orion’s nebula is a dense vertical cluster of Plexiglas rods. A model is an abstraction that makes legible and memorable a construct to project upon the natural world. Geometric form – reduced, pure, idealized – is a utopian gesture that we imagine as a universal language. While in the Babylonian star catalogues, the constellation was perceived as a heavenly shepherd, and for medieval Muslim astronomy it was known as a giant, to the Lakota it forms the spine, ribs and head of a bison, and is called the ‘winter-maker’ by the Ojibwa, as its appearance signals the change of the seasons. In Greek mythology, Orion was a huntsman. Blinded at Chios, he regained his sight when bathed in sunlight, an allegory of modern science elaborated in Phillip Glass’s 2002 opera Galileo Galilei. Orion was killed at the hand of Artemis and placed among the stars by Zeus. In less elevated narratives his stellar (or perhaps galactic or universal) presence is not unlike that of the cosmic entities of the Marvel Universe, attributed with the ability to serve a natural function in the universe and to influence the universe itself. Cosmic Chandelier is a dynamic rendering. Responding to the night’s near-darkness and the daytime’s cast shadows, the intensity of the swaying glass orbs will fluctuate. Representing the nebula of cosmic gases where new stars are born, the emitted many-toned light undulates in rhythmic sequence of bright and dim. The colour and texture of the copper surfaces will change in response to the influence of moisture in the atmosphere over time. In tracking these phenomena, the artwork reflects the daily, monthly, and yearly rotations of celestial bodies, earthly conditions and the routines of human life. Ward has created models for speculative thought in earlier work. In her video installation Radical Rupture (2005-2008), Ward constructed an environment to view the creation of a universe, one star at a time. Reclining on bean bag chairs, viewers looked up at a projection screen suspended at an angle between the wall and ceiling and listened to a recording of Herbert Marcuse deliver a lecture at the Congress on the Dialectics of Liberation in 1967. At the mid-point of his argument, the stars that were revealed began to disappear one by one until total darkness consumed the space. These paired speculations – Marcuse’s proposition regarding cycles of oppression and Ward’s alternate universe expanding and collapsing – tie two temporal frames together in a taut orbit. While Radical Rupture used projected light on a flat plane to cast our thinking into the void, Cosmic Chandelier is a luminescent, scaled-down spectacle of what might be glimpsed if one could see through the building to the sky beyond. While recognizing our capacity for wonder and curiosity, it brings down to earth our impulse to model the universe in our own image. 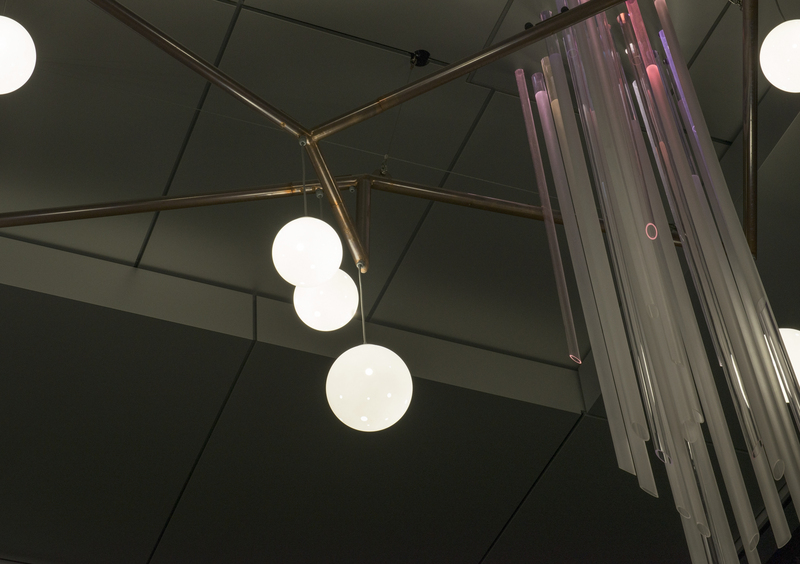 Cosmic Chandelier places these systems of thinking in an unfolding dialogue that can be returned to, viewed from different perspectives and under changing conditions. Based between Vancouver and Heffley Creek, BC, Holly Ward is an interdisciplinary artist working with sculpture, multi-media installation, architecture, video and drawing as a means to examine the role of aesthetics in the formation of new social realities. Stemming from research into various visionary practices such as utopian philosophy, science fiction literature and counter-cultural projects, her work investigates the arbitrary nature of symbolic designation and the use-value of form while soliciting engagement in public spaces.